Established in 1997, Thisara Thanapathy Architects, belong to the creative breed of contemporary Sri Lankan architectural practices. Since inception, they have designed and completed numerous projects, originating from small residential houses, to civic, industrial and commercial buildings.Their architecture embraces beauty, well-being and nature. From the inception of the practice, they have focused on the aesthetic experience of spatial from, delivering sensual delight to their clients while addressing their practical requirements. Over the years, they have come to emphasize equally the caring for both body and mind through design: relaxation, nourishment and rejuvenation. They treat the spaces wthey create as sanctuaries from the stresses of modern society; antidotes to relentless consumerism and environmental destruction. As such, their designs advance ecologically sensible solutions, involving innovative technologies, architectural forms and urban design. The meaning of their work derives from the particular location of a project as much as its mediation by the three larger detentions of society, culture and nature. 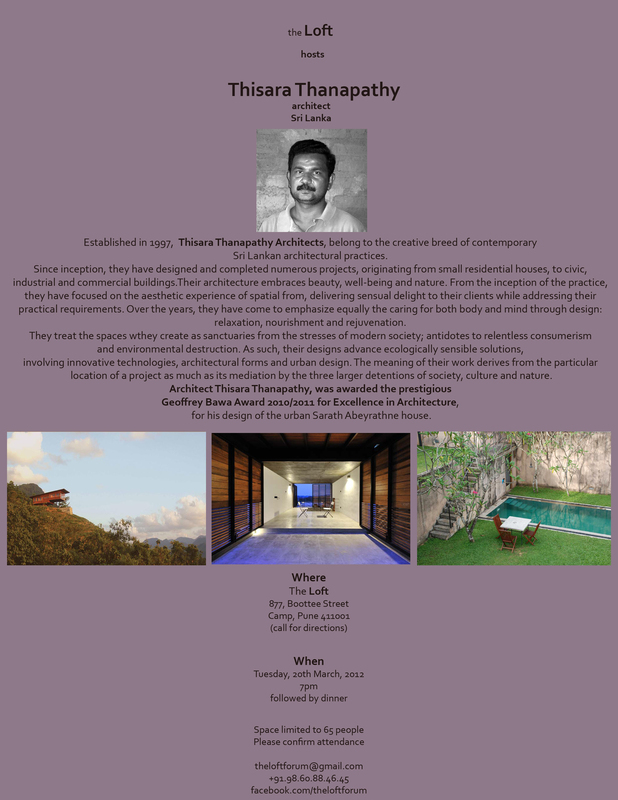 Architect Thisara Thanapathy, was awarded the prestigious Geoffrey Bawa Award 2010/2011 for Excellence in Architecture, for his design of the urban Sarath Abeyrathne house.